Buffett’s message will resonate with bookworms as well as those who want to read more. Sadly, books rarely come up in conversations about professional self-development nowadays. This is a shame because a thoughtful reading routine is probably the cheapest, easiest and most enjoyable route to honing critical skills – for example, focus, empathy, problem solving and decision making. Science has also found that literature keeps you at the top of your brain game by sharpening your memory and slowing down mental decay. So here are a few way in which you can formulate a better reading habit. DIVERSIFY AND EXPAND According to Warren Buffett, Charlie Munger – one of the world’s most effective problem solvers – swears by the wisdom of multiple models. He encourages people to go out there and learn about all kinds of things because varied knowledge is crucial to making smart decisions in today’s complex world. This is particularly relevant to those who have followed a single track through their years of education and work. Reading a diverse array of books is the best way to familiarise yourself with multiple models, and thus expand your intellectual horizons and take your thinking skills to a higher level. Don’t limit yourself to written works that address only your area of expertise; look beyond the obvious. In other words, investment bankers would do well to pick up a collection of poetry while professors of poetry could benefit by diving into financial literature. ENHANCE EMPATHY At the heart of any good story – fictional or factual – is the notion of empathy. As a reader, you are emotionally transported into the lives of characters, imagining their emotions, understanding their motivations and living their truth. From queens to pickpockets, prison guards to refugees and presidents to students, reading a well-written tale is like borrowing someone’s life for a while. And its impact can linger long after the last page has been turned. Let’s say that you, a team leader at work, read the first person account of a socially awkward man who struggles to form meaningful connections. Through his words, you gain an intimate view into his everyday challenges and how other people mistake his shyness for rudeness. With this fresh perspective, you look at an unpopular team member with fresh eyes and realise he isn’t aloof or arrogant – he’s merely socially awkward. So you begin making an effort to get to know him better and help him feel like part of the team. In time, he becomes an integral part of the group and everyone benefits from his expertise – all thanks to the story you read, which enabled you to walk in someone else’s shoes, cultivate greater empathy and ultimately become a more effective team leader. READ TO REFRESH In a world of endless screens, we’re always on high alert, waiting for the next ping or beep. Is it any wonder our cortisol levels go through the roof? A few years ago, a study found that reading was the most effective way to relax – even more than listening to music or taking a walk. A mere six minutes into this activity, your muscles unclench and the heart rate slows down. This makes a book the perfect antidote to stress. On a particularly bad day, take a paperback to keep you company during your lunch hour because even a short read will reenergise and help you deal with the obstacles that lie ahead. GETTING STARTED There are a few simple ways to be a better, smarter reader. Firstly, make it a point to read every single day even if it’s for only 15-20 minutes. 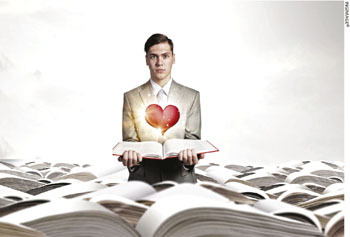 Begin with something that interests you – a biography, novel or feature story. As your reading habit becomes stronger, you can start exploring different types of written work. And avoid multitasking while you read because this takes away your focus from the story and its benefits that are memory related. Finally, create a starter kit of diverse titles you’d like to tackle over the next six to 12 months. Check out reviews on Goodreads, book columns in magazines, and must-read lists by prolific readers like Bill Gates and Oprah Winfrey to come up with your own collection.